There is talk of a renewed Argentine Grand Prix in 2013 to be held in Mar del Plata, a resort town on the South Atlantic near the birthplace of Juan Manuel Fangio. It would be a seaside race at the end of the season, in December, allowing for an awesome Southern Hemisphere combination of racing, steak and sunshine. But when there is talk of a renewed Argentine Grand Prix, it’s hard not to think of Potrero de los Funes, possibly the most thrilling racing circuit this side of Spa and the Nürburgring, and not only because it’s inside the caldera of an extinct volcano. The 3.9-mile Potrero de los Funes Circuit—which is inside the caldera of an extinct volcano—has blind corners, wild elevation changes, fantastic scenery and great flow, as you can see demonstrated by a Nissan GT-R in the video above. 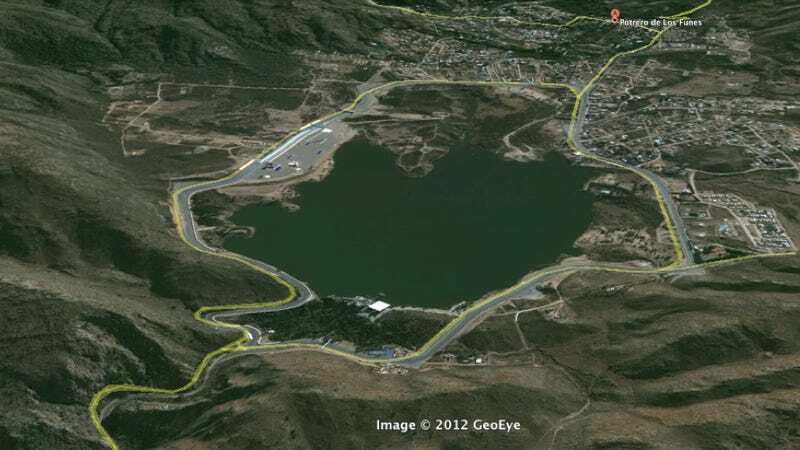 Don’t mind the buses and the ambulances: Potrero de los Funes Circuit uses some of the public road around the 890-acre reservoir inside the crater. Sadly, it’s never going to happen. Potrero de los Funes is in San Luis province, 500 miles from Buenos Aires, in the middle of nowhere. It’s a plesant, hilly area, at the southernmost reach of the Sierras de Córdoba mountain range, but, yeah, it couldn’t really compete with Mar del Plata in attracting non-geek visitors who would only come for the steak and the sunshine with a dash of racing on the side. But that track is an absolute gem. Because volcano.